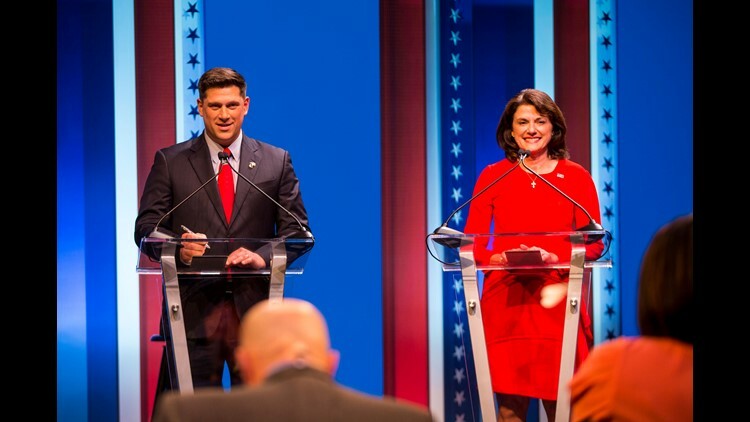 Republican U.S. Senate candidates Kevin Nicholson and Leah Vukmir stand at their podiums at the start of a debate at the University of Wisconsin-Milwaukee Thursday. WASHINGTON – Republican voters will decide Tuesday between a gubernatorial candidate who once called President Donald Trump "unfit" and another who once called him a "jackass." Democrats, meanwhile, will weigh whether to look beyond the arrest record of a candidate called "the Iron Stache" in his bid for a trophy: retiring House Speaker Paul Ryan's seat. There's plenty of quirky on the ballot as the next batch of primaries plays out in Wisconsin, Minnesota, Connecticut and Vermont. And just wait: Sen. Bernie Sanders and Vermont Democrats have a fun story, too. Trump loyalty is on the ballot in a head-to-head GOP Senate primary battle between state Sen. Leah Vukmir and Marine Corps veteran and first-time candidate Kevin Nicholson. They are vying to take on Democratic Sen. Tammy Baldwin, who is favored to win in the fall. But a potentially damaging video from 2016 recently emerged showing Vukmir bashing Trump as “offensive to everyone” at an event hosted by “Never Trumper” Charlie Sykes. "President Trump is very popular with Republicans nationally, and most polls suggest the same is true in Wisconsin," said Geoffrey Skelley, associate editor of Sabato’s Crystal Ball at the University of Virginia Center for Politics. "This could be problematic for Vukmir." Vukmir is the establishment favorite endorsed by the state party, while Nicholson portrays himself as a conservative outsider. He is endorsed by conservative organizations, including Club for Growth, though he was once a rising star in the Democratic Party. 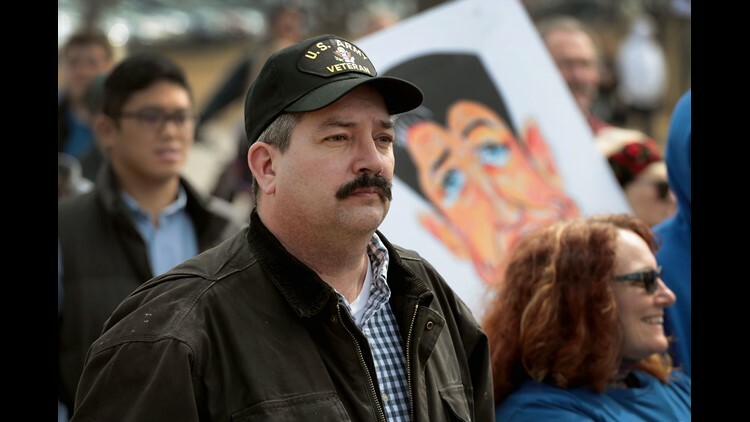 Randy Bryce joins other residents at a rally to show support for students who finished the last leg of a 50-mile march through Wisconsin in the hometown of House Speaker Paul Ryan to call attention to gun violence on March 28, 2018, in Janesville, Wisconsin. The Democratic gubernatorial primary has drawn a field of eight candidates vying to oust GOP Gov. Scott Walker. Polls show State Schools Superintendent Tony Evers is leading the field. And while analysts say the race leans Republican in the fall, polls suggest Walker is vulnerable. Tuesday’s primary will decide which Democrat gets to compete for Ryan’s open seat. Democrats are backing iron worker Randy Bryce – known as the “Iron Stache” – who has significantly outraised his opponent, Janesville School Board Member Cathy Myers. But his history of arrests, including operating a vehicle under the influence of alcohol in 1998, could be problematic. Myers also filed a Federal Election Commission complaint against him, claiming he converted campaign funds to personal use. In the GOP primary, Ryan has endorsed his former staffer, University of Wisconsin regent Bryan Steil, who is an attorney for a manufacturing company. It's a busy election season here, with voters teeing up contests for an open governor's seat, both Senate seats, and three open House seats. The race to replace retiring Democratic Gov. Mark Dayton in November is a toss-up, analysts say, in a state former Democratic presidential candidate Hillary Clinton won by only 1.5 percentage points. Minnesota Gov. 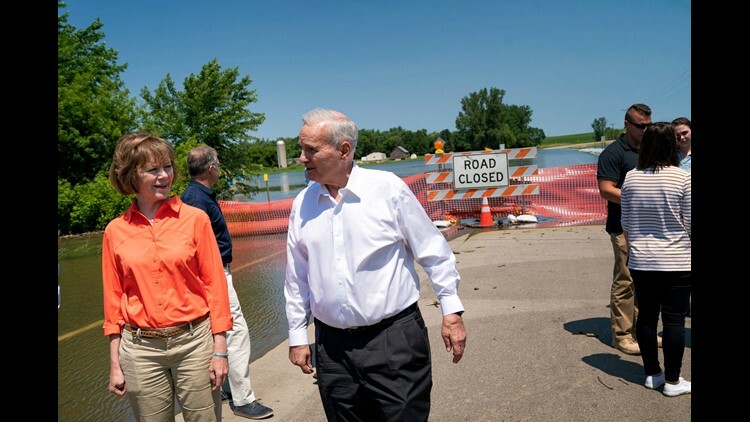 Mark Dayton, center, and Sen. Tina Smith, left, observe flooding in Currie, Minn., one of the hardest hit areas in recent flooding, July 6, 2018. Former Gov. Tim Pawlenty, who left office in 2011, is favored to win the GOP primary, but the party’s 2014 nominee, Jeff Johnson, now a county commissioner, could win by playing to the conservative grassroots, Skelley said. As they target conservative voters, the candidates both seem to be struggling to explain comments they made about Trump in 2016: Pawlenty called him "unhinged and unfit," and Johnson called him a "jackass." The Democratic-Farmer-Labor Party endorsed State Rep. Erin Murphy, but her strongest opponents include U.S. Rep. Tim Walz and state Attorney General Lori Swanson. Walz and Rep. Rick Nolan, a lieutenant governor candidate on Swanson’s ticket, are leaving open two of Democrats’ most vulnerable seats in the country – each voted for Trump – to run for statewide office. Former Minnesota Gov. 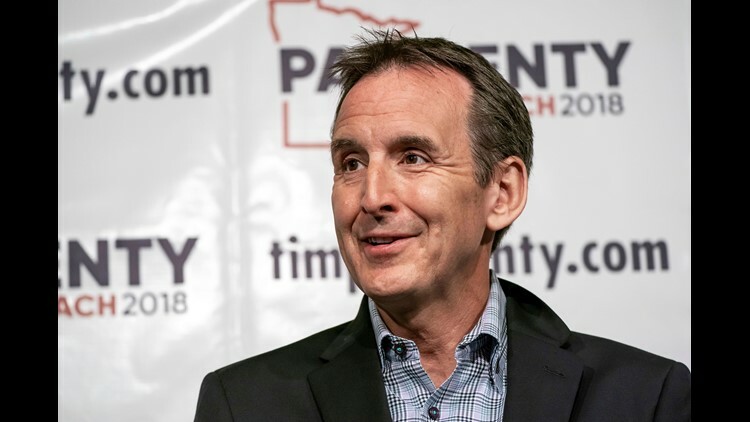 Tim Pawlenty speaks at a news conference in St. Paul, Minn., May 31, 2018. The DFL primary in Nolan’s Iron Range district is largely a two-way race between Nolan’s 2016 campaign manager and former state Rep. Joe Radinovich and state Rep. Jason Metsa, who is backed by unions, according to David Wasserman, House editor of the nonpartisan Cook Political Report. State Rep. Ilhan Omar and former state House Speaker Margaret Anderson Kelliher are considered the Democratic front-runners in Minneapolis, a safe blue district being vacated by Rep. Keith Ellison, who is running for state attorney general. If she were to win in November, Omar, who once lived in a Kenyan refugee camp, would become the first Somali-American Muslim in the House. Sen. Tina Smith, who was appointed to fill a vacancy left by Sen. Al Franken, faces a high-profile special election challenger in Richard Painter, a former ethics lawyer in the George W. Bush White House who left the GOP and has become a hero to the resistance as a frequent Trump critic. On the GOP side, state Sen. Karin Housley, who is married to NHL's Buffalo Sabres Head Coach Phil Housley, has her party’s endorsement. Retiring Democratic Gov. Dan Malloy’s deep unpopularity gives Republicans a shot at the governor’s mansion in this blue state for the first time in eight years. Republicans have narrowed a crowded field to five candidates. The state GOP endorsed Danbury Mayor Mark Boughton in his third bid for governor. Finishing second at the party’s state convention was Tim Herbst, the former first selectman of Trumbull. On the Democratic side, businessman and 2010 gubernatorial candidate Ned Lamont is considered the front-runner in the race against Bridgeport Mayor Joe Ganim, who made a political comeback after serving time in prison for corruption charges during an earlier stint in elected office. 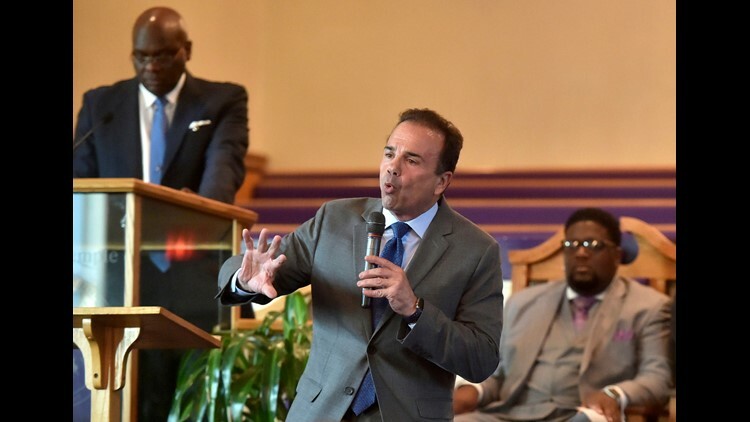 Bridgeport Mayor and Connecticut Democratic gubernatorial candidate Joe Ganim, center, answers questions during a forum sponsored by the Joshua Generation Clergy Association at the New Trinity Temple Church of God in Christ in New Haven, Conn., Aug. 6, 2018. A scandal opened up the state’s most competitive House district in April, when Rep. Elizabeth Esty announced she would not seek re-election amid mounting criticism for her delay in firing a chief of staff accused of sexually harassing a woman in her office. Still, the congressional delegation's all-Democratic makeup isn’t expected to change this cycle. Attention is focused on a two-way Democratic primary for this seat between former Simsbury First Selectman Mary Glassman and political newcomer Jahana Hayes, who was the 2016 National Teacher of the Year. 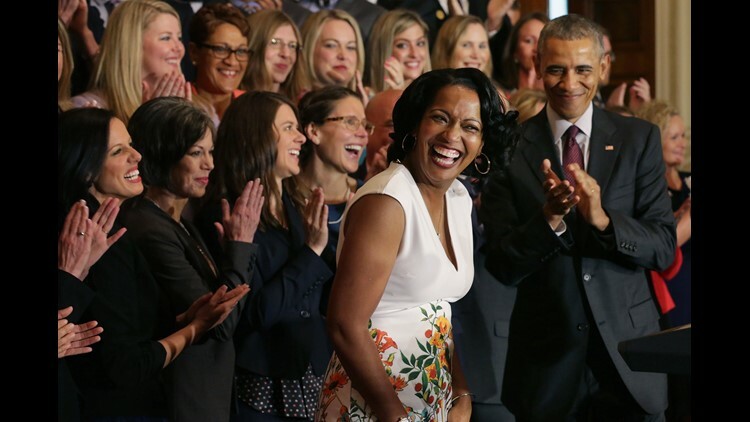 National Teacher of the Year Jahana Hayes of John F. Kennedy High School in Waterbury, Conn., takes the stage with President Barack Obama and her fellow state teachers of the year during a ceremony in the East Room of the White House May 3, 2016, in Washington, D.C.
Murphy will face either Matthew Corey, a three-time congressional candidate, or longtime Apple executive Dominic Rapini in the fall, but he is expected to retain his seat. Sen. Bernie Sanders, I-Vt., responds to a question during a town hall meeting in Jackson, Miss., on April 4, 2018. Sen. Bernie Sanders is running for the Democratic nomination, but that doesn’t mean he plans to accept it. The longest-serving independent in Congress, who ran in the Democratic primary for president in 2016, in past elections has declined the nomination but accepted the Democratic endorsement. His campaign manager Shannon Jackson said he plans to do the same thing again and continue running as an independent. The unique arrangement in previous years has left Vermont Democrats without a candidate on the ballot, but they’re OK with that, given their close relationship with Sanders. In fact, the state party overwhelmingly passed a resolution in May that effectively deems him a Democrat if he wins their endorsement and caucuses with Democrats in the Senate. “We are proud of his role as a leader in the U.S. Senate Democratic Caucus, and as a powerful voice for Democratic values, issues and candidates,” said the state party spokesman, R. Christopher Di Mezzo. 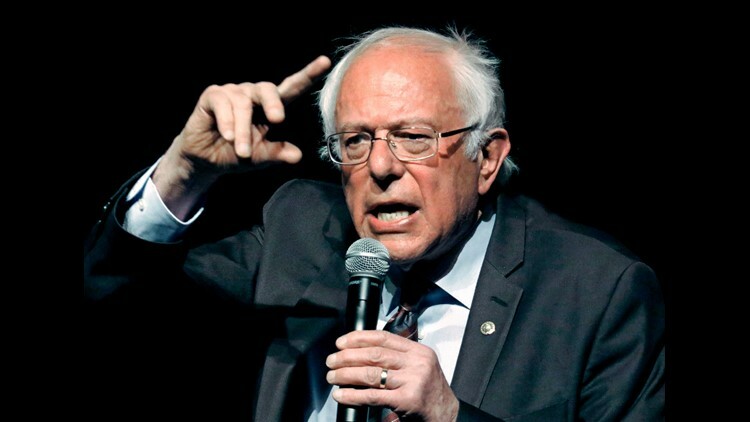 Sanders, who is running for his third Senate term, doesn’t have a serious primary opponent and the potential GOP candidates are unlikely to make headway against Sanders, who won his last election with 71 percent of the vote. Not much is expected to change in Vermont. Rep. Peter Welch, a Democrat, and Gov. Phil Scott, a Republican, are expected to win their primaries and the general election. But the Democratic gubernatorial primary will still be fun to watch. Candidate Ethan Sonneborn is running to get more young people engaged in politics – and no wonder. He’s 14.